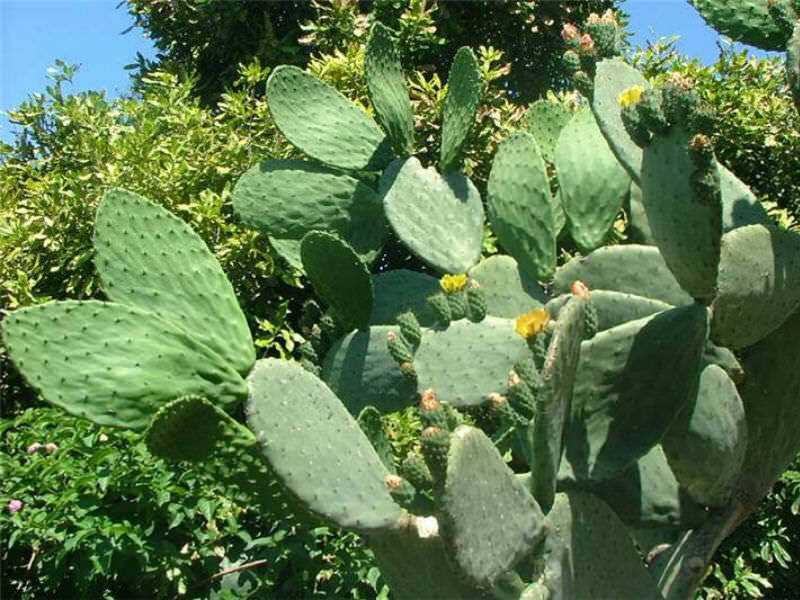 Opuntia ficus-indica is a slow growing perennial shrub up to 16.5 feet (5 m) high. The root-system spreads horizontally. Stems (cladodes) are very thick, succulent, oblong to spatulate, up to 2 feet (60 cm) long and up to 10 inches (25 cm) wide. The epidermis is very thick and waxy, thus very water repellent and sun reflecting. Flowering occurs on 1-2 year-old cladodes. Flowers open in the late morning. The fruit is succulent, reddish, ellipsoid, up to 3 inches (7.5 cm) long and edible. 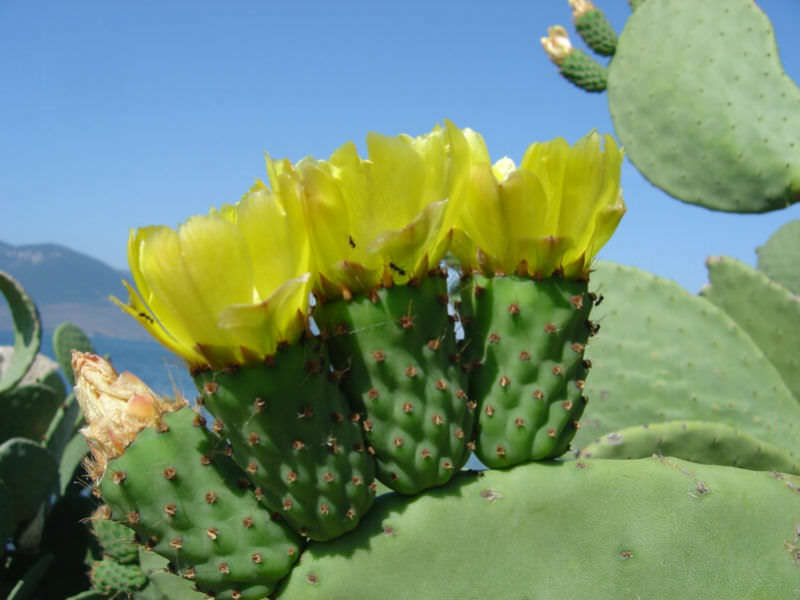 Though the large variety of species within the Opuntia genus means different types of Prickly Pears may need slightly different care. All are desert cacti that need lots of sun, lots of light and very little water. If you live in a hot, arid area, these plants can generally be planted outside, left alone, and enjoyed. These cacti will grow just fine in a garden, bu they can be grown in pots as well. To repot, ensure the soil is dry, then remove the pot and knock away the old soil. After treating any cuts with fungicide, place the cactus in a new pot and backfill it with potting soil. 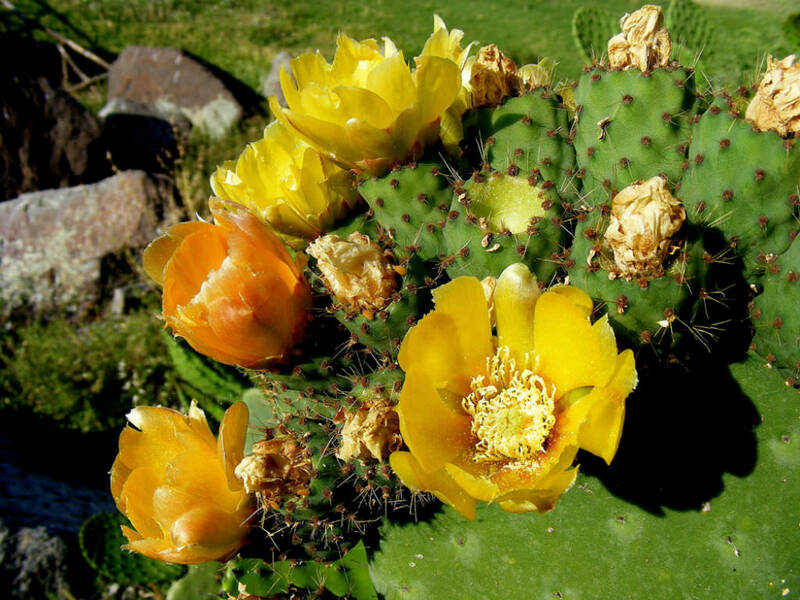 As with a new cutting, make sure not to water a newly repotting Prickly Pear for a brief period to avoid rotting its roots. 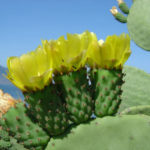 Opuntia ficus-indica is a species of cactus that has long been a domesticated crop plant important in agricultural economies throughout arid and semiarid parts of the world. 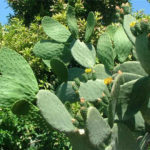 It is grown primarily as a fruit crop, but also for the vegetable nopales and other uses. 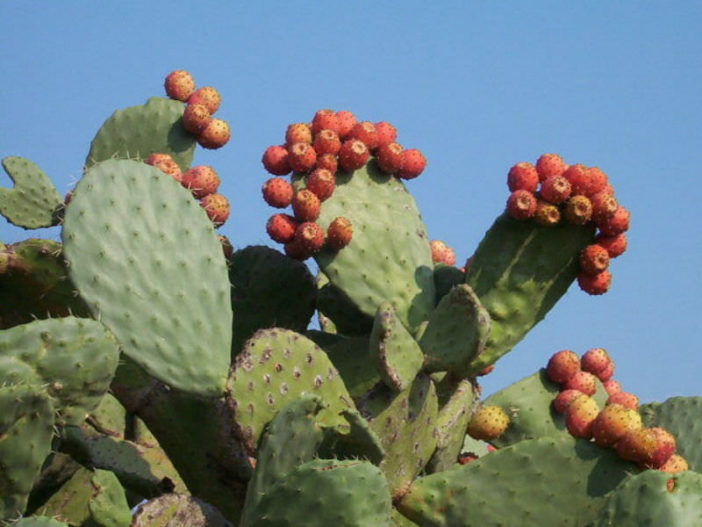 Most culinary references to the “Prickly Pear” are referring to this species. 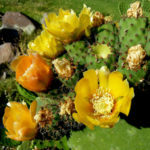 The name “Tuna” is also used for the fruit of this cactus, and for Opuntia in general… – See more at: Indian Fig Opuntia – A Fruit and Vegetable Rolled Up into One Plant . Native to Mexico and is widespread in Central America, Southern USA, Africa, Asia and Southern Europe.